Ref 1. [Goodman’s 14] Goodman’s catalogue of 1914, Persimmons sold for 2/6 each or 24/- per dozen. 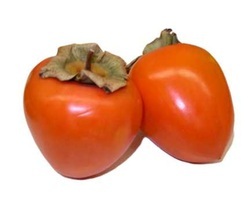 "The fruit of the Persimmon, when ripe, is of a seep reddish orange color, shape that of an orange. The flavor, when perfectly ripe, is most lucious. It is best kept for a time after being picked, and is then most delicious. The fruit ripens during winter, and is in consequence valuable for the table at a season when fruit is scarce." The catalogue used American spelling for words such as color (colour) and flavor (flavour) and this has been retained. The catalogue says- "The fruit of the Persimmon, when ripe, is of a deep reddish orange colour, in shape that of an orange, and some egg-shaped. It is best kept in a closed jar after being picked, and is then most delicious." WASHINGTON Planted by the Thistlethwaite at briagolong around the turn of the century. American Persimmons (Diospyros virginiana) These are generally budded or grafted onto seedling rootstocks of D. virginiana. Seed germination can be slow and cool storage at about 10 degrees C for 60-90 days is advisable (Hartmann and Kester). Sticking them in the fridge for a while should help. Oriental Persimmons (D. kaki) can be grafted or budded onto seedling rootstocks, grafting being prefered. They can also be grafted onto D. lotus seedlings. Cool storage at 10 degrees C for 120 days helps the germination of both these. Thanks to Ulrich Hapke for help with ripening times.